Born: 1 March 1909, Upington, South Africa . Died: 1995, Johannesburg, South Africa . Herman Steyn qualified as a veterinaian (BVSc, University of Pretoria) in 1932. He joined the civil service as State Veterinarian in the Waterberg area in 1933, being transferred to Kimberley in 1934 and to the Armoedsvlakte Research Station, near Vryburg, from 1935 to 1937. In the latter year he was appointed on the staff of the Department of Surgery and Obstetrics at the Onderstepoort Veterinary Institute, where he studied reproductive problems in horses and sheep. He resigned in 1945 to start a private practice and in 1965 retired to his farm. 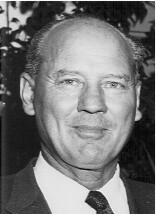 Steyn was President of the South African Veterinary Association from 1958 to 1966 and a member of the Veterinary Board for the same period. He was also the founder and first chairman of the SA Veterinary Foundation and the Equine Practioners Group and was awarded The President's Award of the South African Veterinary Association in 1993. In Memoriam: H.P.Steyn. VetNews, February 1996, p. 10. SAVA Presidential Award: H.P.Steyn. Journal of the South African Veterinary Association, 1993, Vol. 64, pp. 189-190.